Guidebooks are always fun -- even if you're not going to visit the place in question. Maybe even especially if you're not going to visit. But it does take a special kind of writer to do a guide for a place you can't visit. Stephen Briggs has done that for Terry Pratchett's Discworld, repeatedly. Alberto Manguel and Gianni Guadalupi, in their wonderful Dictionary of Imaginary Places, did it for hundreds of places on a smaller scale. Pamela Wharton Blanpied's sublimely quirky Dragons: The Modern Infestation did it for our world as we never knew it. But those are all fictional worlds we can't visit. There are plenty of real places that we can't get to anymore. And Thames & Hudson has been putting out a series of guidebooks to them, written for either the amateur historian or the jobbing time-traveler, covering Ancient Rome and Ancient Athens as well as this volume, Shakespeare's London on Five Groats a Day, written by author and lecturer (and trainer-of-tour-guides, perhaps even a better qualification) Richard Tames. 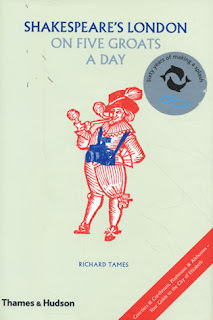 I do have to look over my spectacles at Mr. Tames's misleading title, since Five Groats makes no attempts to help the traveler actually stay under that budget: it has no listings of lodgings with prices, as most guidebooks would, and is scanty with prices in general. The penny-pinching time-traveler will not be greatly aided by this book, and should be careful not to be misled by the title into expecting more than will be provided. Those of us without a mechanism to physically visit Elizabethan London, though, will be greatly entertained: Tames provides a lively and well-illustrated (with contemporary paintings and drawings) look at the people and pastimes, culture and celebrations, leading lights and ordinary citizens of what was then the largest city in Europe. This is an excellent guide to a city we cannot visit, and in particular does a good job of pointing out ways in which its inhabitants are notably different from modern people. It costs more than five groats, but if you spread the reading of it over several days, I think you can make it fit within your budget.